The scientific method is a systematic approach to acquiring and establishing knowledge about how the world works. A scientific investigation typically starts with the formulation of a hypothesis – an educated, evidence-based guess about the mechanism behind the phenomenon being studied – and proceeds by testing how well the hypothesis holds up against experiments designed to disconfirm it. “…[Man] makes this cosmos and its construction the pivot of his emotional life in order to find in this way the peace and serenity which he cannot find in the narrow whirlpool of personal experience. The supreme task is to arrive at those universal elementary laws from which the cosmos can be built up by pure deduction. There is no logical path to these laws; only intuition, resting on sympathetic understanding of experience can reach them…” – quoted from Zen and The Art of Motorcycle Maintenance by Robert Pirsig. The American philosopher, Charles Peirce, recognised that hypothesis generation involves a special kind of reasoning, one that enables the investigator to zero in on a small set of relevant facts out of an infinity of possibilities. “A given object presents an extraordinary combination of characters of which we should like to have an explanation. That there is any explanation of them is a pure assumption; and if there be, it is [a single] fact which explains them; while there are, perhaps, a million other possible ways of explaining them, if they were not all, unfortunately, false. A man is found in the streets of New York stabbed in the back. The chief of police might open a directory and put his finger on any name and guess that that is the name of the murderer. How much would such a guess be worth? But the number of names in the directory does not approach the multitude of possible laws of attraction which could have accounted for Kepler’s law of planetary motion and, in advance of verification by predications of perturbations etc., would have accounted for them to perfection. Newton, you will say, assumed that the law would be a simple one. But what was that but piling guess on guess? Surely vastly more phenomena in nature are complex than simple…” – quoted from this paper by Thomas Sebeok. 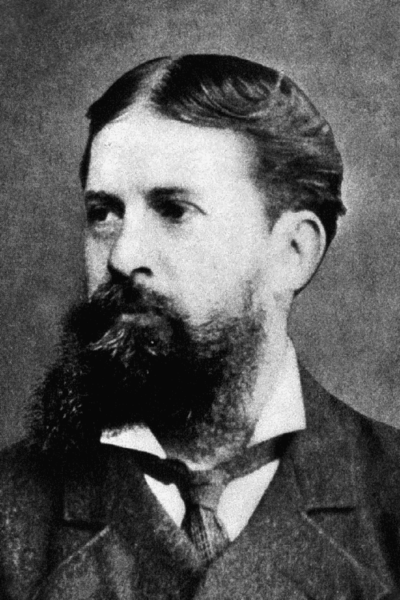 Peirce coined the term abduction (as opposed to induction or deduction) to refer to the creative act of hypothesis generation. In the present day, the term is used to the process of justifying hypotheses rather than generating them (see this article for more on the distinction). In the remainder of this piece I will use the term in its Peircean sense. The lady gave a violent start and stared in bewilderment at my companion. Abductive reasoning is essentially about recognising which trifles are important. I have a gold chain that my mum gave me many years ago. I’ve worn it for so long that now I barely notice it. The only time I’m consciously aware that I’m wearing the chain is when I finger it around my neck, a (nervous?) habit I have developed over time. As you might imagine, I’m quite attached to my gold chain. So, when I discovered it was missing a few days ago, my first reaction was near panic, I felt like a part of me had gone missing. Since I hardly ever take the chain off, I could not think of any plausible explanation for how I might have lost it. Indeed, the only time I have had to consistently take the chain off is when going in for an X-ray or, on occasion, through airport security. Where could it have gone? After mulling over it for a while, the only plausible explanation I could think of is that I had taken it off at airport security when returning from an overseas trip a week earlier, and had somehow forgotten to collect it on the other side. Realising that it would be near impossible to recover it, I told myself to get used to the idea that it was probably gone for good. That Sunday, I went for a swim. After doing my laps, I went to the side of the pool for my customary shower. Now, anyone who has taken off a rash vest after a swim will know that it can be a struggle. I suspect this is because water trapped between skin and fabric forms a thin adhesive layer (a manifestation of surface tension perhaps?). Anyway, I wrestled the garment over my head and it eventually came free with a snap, generating a spray of droplets that gleamed in reflected light. …A near forgotten memory: I vaguely recalled a flash of gold while taking of my rash vest in the pool shower some days ago. Was it after my previous swim or the week earlier, I couldn’t be sure. But I distinctly remembered it had bothered me enough to check the floor of the cubicle cursorily. Finding nothing, I had completely forgotten about it and moved on. Could it have come off there? As I thought about it some more, possibility turned to plausibility: I was convinced it was what had happened. Although unlikely I would find it there now, it was worth a try on the hope that someone had found the chain and turned it in as lost property. I stopped over at the pool on my way back from the movies and asked at reception. I described it down to the brief inscription on the clasp. It took longer than that but he soon emerged, chain in hand. 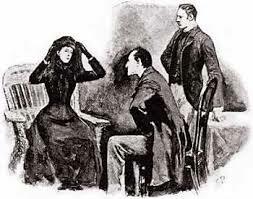 Endnote: in case you haven’t read it yet, I recommend you take ten minutes to read Sherlock Holmes’ finest adventure and abductive masterpiece, The Adventure of the Speckled Band. This article covers the why, what and how of Monte Carlo simulation using a canonical example from project management – estimating the duration of a small project. Before starting, however, I’d like say a few words about the tool I’m going to use. Despite the bad rap spreadsheets get from tech types – and I have to admit that many of their complaints are justified – the fact is, Excel remains one of the most ubiquitous “computational” tools in the corporate world. Most business professionals would have used it at one time or another. So, if you you’re a project manager and want the rationale behind your estimates to be accessible to the widest possible audience, you are probably better off presenting them in Excel than in SPSS, SAS, Python, R or pretty much anything else. Consequently, the tool I’ll use in this article is Microsoft Excel. For those who know about Monte Carlo and want to cut to the chase, here’s the Excel workbook containing all the calculations detailed in later sections. However, if you’re unfamiliar with the technique, you may want to have a read of the article before playing with the spreadsheet. In keeping with the format of the tutorials on this blog, I’ve assumed very little prior knowledge about probability, let alone Monte Carlo simulation. Consequently, the article is verbose and the tone somewhat didactic. 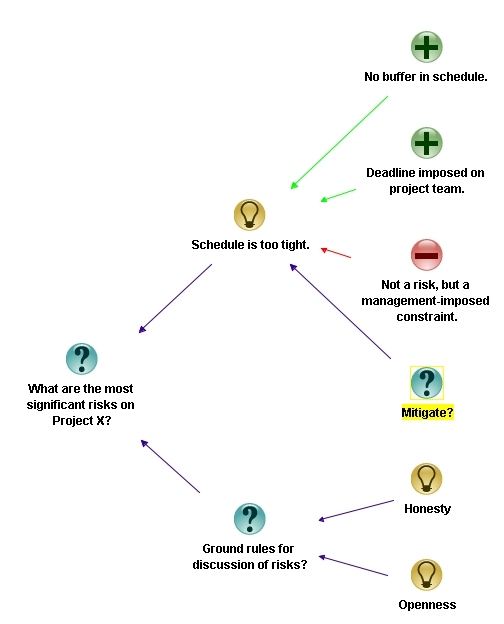 Estimation is key part of a project manager’s role. The most frequent (and consequential) estimates they are asked deliver relate to time and cost. Often these are calculated and presented as point estimates: i.e. single numbers – as in, this task will take 3 days. Or, a little better, as two-point ranges – as in, this task will take between 2 and 5 days. Better still, many use a PERT-like approach wherein estimates are based on 3 points: best, most likely and worst case scenarios – as in, this task will take between 2 and 5 days, but it’s most likely that we’ll finish on day 3. We’ll use three-point estimates as a starting point for Monte Carlo simulation, but first, some relevant background. It is a truism, well borne out by experience, that it is easier to estimate small, simple tasks than large, complex ones. Indeed, this is why one of the early to-dos in a project is the construction of a work breakdown structure. However, a problem arises when one combines the estimates for individual elements into an overall estimate for a project or a phase thereof. It is that a straightforward addition of individual estimates or bounds will almost always lead to a grossly incorrect estimation of overall time or cost. The reason for this is simple: estimates are necessarily based on probabilities and probabilities do not combine additively. Monte Carlo simulation provides a principled and intuitive way to obtain probabilistic estimates at the level of an entire project based on estimates of the individual tasks that comprise it. The best way to explain Monte Carlo is through a simple worked example. So, let’s consider a 4 task project shown in Figure 1. In the project, the second task is dependent on the first, and third and fourth are dependent on the second but not on each other. The upshot of this is that the first two tasks have to be performed sequentially and the last two can be done at the same time, but can only be started after the second task is completed. To summarise: the first two tasks must be done in series and the last two can be done in parallel. Figure 1; A project with 4 tasks. OK, so that’s the situation as it is given to us. The first step to developing an estimate is to formulate the problem in a way that it can be tackled using Monte Carlo simulation. This bring us to the important topic of the shape of uncertainty aka probability distributions. Consider the data for Task 1. You have been told that it most often finishes on day 4. However, if things go well, it could take as little as 2 days; but if things go badly it could take as long as 8 days. Therefore, your range of possible finish times (outcomes) is between 2 to 8 days. Clearly, each of these outcomes is not equally likely. The most likely outcome is that you will finish the task in 4 days (from what your team member has told you). Moreover, the likelihood of finishing in less than 2 days or more than 8 days is zero. 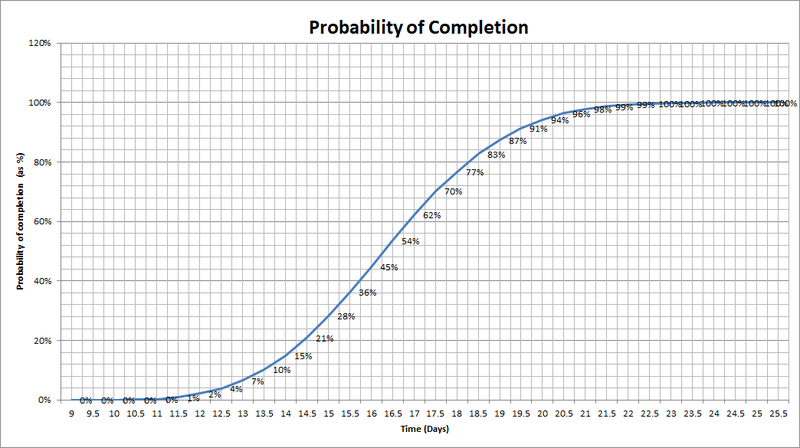 If we plot the likelihood of completion against completion time, it would look something like Figure 2. 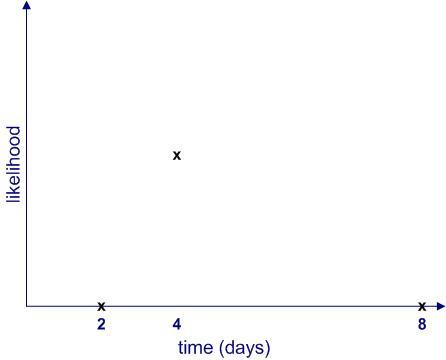 Figure 2: Likelihood of finishing on day 2, day 4 and day 8. What are the relative likelihoods of completion for all intermediate times – i.e. those between 2 to 4 days and 4 to 8 days? How can one quantify the likelihood of intermediate times? In other words, how can one get a numerical value of the likelihood for all times between 2 to 8 days? Note that we know from the earlier discussion that this must be zero for any time less than 2 or greater than 8 days. The two questions are actually related. As we shall soon see, once we know the relative likelihood of completion at all times (compared to the maximum), we can work out its numerical value. 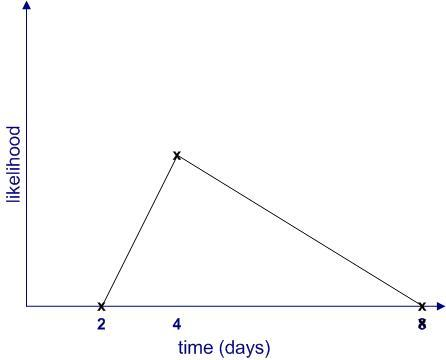 Since we don’t know anything about intermediate times (I’m assuming there is no other historical data available), the simplest thing to do is to assume that the likelihood increases linearly (as a straight line) from 2 to 4 days and decreases in the same way from 4 to 8 days as shown in Figure 3. This gives us the well-known triangular distribution. Jargon Buster: The term distribution is simply a fancy word for a plot of likelihood vs. time. Of course, this isn’t the only possibility; there are an infinite number of others. Figure 4 is another (admittedly weird) example. Figure 4: Another distribution that fits the points in Figure 2. Further, it is quite possible that the upper limit (8 days) is not a hard one. It may be that in exceptional cases the task could take much longer (for example, if your team member calls in sick for two weeks) or even not be completed at all (for example, if she then leaves for that mythical greener pasture). Catering for the latter possibility, the shape of the likelihood might resemble Figure 5. The main takeaway from the above is that uncertainties should be expressed as shapes rather than numbers, a notion popularised by Sam Savage in his book, The Flaw of Averages. [Aside: you may have noticed that all the distributions shown above are skewed to the right – that is they have a long tail. This is a general feature of distributions that describe time (or cost) of project tasks. It would take me too far afield to discuss why this is so, but if you’re interested you may want to check out my post on the inherent uncertainty of project task estimates. Thus far, I have used the word “likelihood” without bothering to define it. It’s time to make the notion more precise. I’ll begin by asking the question: what common sense properties do we expect a quantitative measure of likelihood to have? If an event is impossible, its likelihood should be zero. The sum of likelihoods of all possible events should equal complete certainty. That is, it should be a constant. As this constant can be anything, let us define it to be 1.
is , in fact, what mathematicians call probability– which explains why I have used the symbol rather than . Now that I’ve explained what it is, I’ll use the word “probability” instead of ” likelihood” in the remainder of this article. With these assumptions in hand, we can now obtain numerical values for the probability of completion for all times between 2 and 8 days. This can be figured out by noting that the area under the probability curve (the triangle in figure 3 and the weird shape in figure 4) must equal 1, and we’ll do this next. Indeed, for the problem at hand, we’ll assume that all four task durations can be fitted to triangular distributions. This is primarily to keep things simple. However, I should emphasise that you can use any shape so long as you can express it mathematically, and I’ll say more about this towards the end of this article. Let’s look at the estimate for Task 1. We have three numbers corresponding to a minimum, most likely and maximum time. To keep the discussion general, we’ll call these , and respectively, (we’ll get back to our estimator’s specific numbers later). Now, what about the probabilities associated with each of these times? Since and correspond to the minimum and maximum times, the probability associated with these is zero. Why? Because if it wasn’t zero, then there would be a non-zero probability of completion for a time less than or greater than – which isn’t possible [Note: this is a consequence of the assumption that the probability varies continuously – so if it takes on non-zero value, , at then it must take on a value slightly less than – but greater than 0 – at slightly smaller than ] . As far as the most likely time, , is concerned: by definition, the probability attains its highest value at time . 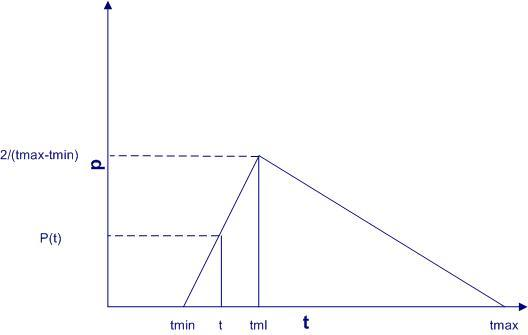 So, assuming the probability can be described by a triangular function, the distribution must have the form shown in Figure 6 below. 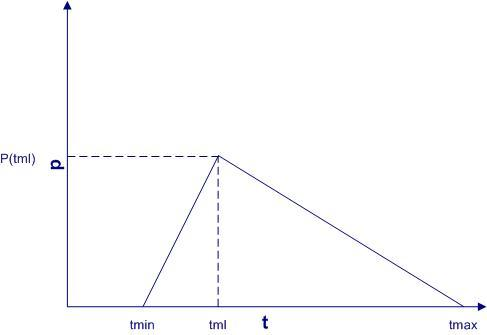 Figure 6: Triangular distribution redux. This is a consequence of the fact that the ratios on either side of equation (3) are equal to the slope of the line joining the points and . Equations 4 and 5 together describe the probability distribution function (or PDF) for all times between and . As expected, starts out with a value 0 at and then increases monotonically, attaining a value of 1 at . To end this section let’s plug in the numbers quoted by our estimator at the start of this section: , and . The resulting PDF and CDF are shown in figures 8 and 9. How likely is it that the project will be completed within 17 days? What’s the estimated time for which I can be 90% certain that the project will be completed? For brevity, I’ll call this the 90% completion time in the rest of this piece. “OK, that sounds great”, you say, “but how exactly do we simulate a single task”? 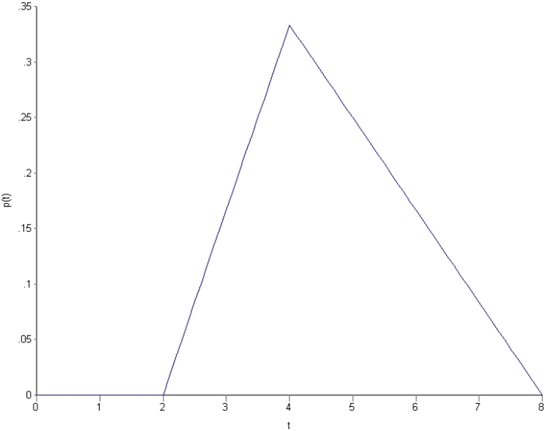 As we saw earlier, the CDF for the triangular has a S shape and ranges from 0 to 1 in value. It turns out that the S shape is characteristic of all CDFs, regardless of the details underlying PDF. Why? Because, the cumulative probability must lie between 0 and 1 (remember, probabilities can never exceed 1, nor can they be negative). generate a random number between 0 and 1, this corresponds to the probability that the task will finish at time t.
find the time, t, that this corresponds to this value of probability. This is the completion time for the task for this trial. Incidentally, this method is called inverse transform sampling. An example might help clarify how inverse transform sampling works. Assume that the random number generated is 0.4905. From the CDF for the first task, we see that this value of probability corresponds to a completion time of 4.503 days, which is the completion for this trial (see Figure 10). Simple! These can be easily combined in a single Excel formula using an IF function, and I’ll show you exactly how in a minute. Yes, we can now finally get down to the Excel simulation proper and you may want to download the workbook if you haven’t done so already. Open up the workbook and focus on the first three columns of the first sheet to begin with. These simulate the first task in Figure 1, which also happens to be the task we have used to illustrate the construction of the triangular distribution as well as the mechanics of Monte Carlo. Rows 6 through 10005 in column A are simulated probabilities of completion for Task 1. These are obtained via the Excel RAND() function, which generates uniformly distributed random numbers lying between 0 and 1. This gives us a list of probabilities corresponding to 10,000 independent simulations of Task 1. The 10,000 probabilities need to be translated into completion times for the task. This is done using equations (8) or (9) depending on whether the simulated probability is less or greater than , which is in cell C3 (and given by Equation (10) above). The conditional statement can be coded in an Excel formula using the IF() function. That’s basically it for the simulation of individual tasks. Now let’s see how to combine them. For tasks in series (Tasks 1 and 2), we simply sum the completion times for each task to get the overall completion times for the two tasks. This is what’s shown in rows 6 through 10005 of column G.
For tasks in parallel (Tasks 3 and 4), the overall completion time is the maximum of the completion times for the two tasks. This is computed and stored in rows 6 through 10005 of column N.
Sheets 2 and 3 are plots of the probability and cumulative probability distributions for overall project completion times. I’ll cover these in the next section. The figure on Sheet 2 of the Excel workbook (reproduced in Figure 11 below) is the probability distribution function (PDF) of completion times. The x-axis shows the elapsed time in days and the y-axis the number of Monte Carlo trials that have a completion time that lie in the relevant time bin (of width 0.5 days). As an example, for the simulation shown in the Figure 11, there were 882 trials (out of 10,000) that had a completion time that lie between 16.25 and 16.75 days. Your numbers will vary, of course, but you should have a maximum in the 16 to 17 day range and a trial number that is reasonably close to the one I got. I’ll say a bit more about Figure 11 in the next section. For now, let’s move on to Sheet 3 of workbook which shows the cumulative probability of completion by a particular day (Figure 12 below). 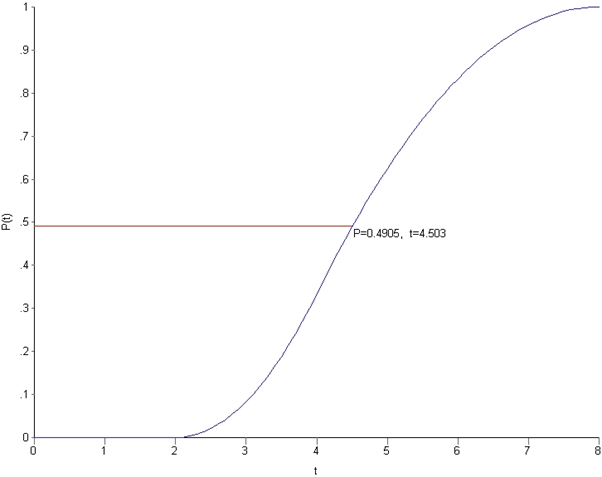 The figure shows the cumulative probability function (CDF), which is the sum of all completion times from the earliest possible completion day to the particular day. What’s the 90% likely completion time? There’s a 60% chance that the project will be completed in 17 days. The 90% likely completion time is 19.5 days. Summing up the first three tasks (remember, Tasks 3 and 4 are in parallel) we get a total of 22.3 days, which is clearly an overestimation. Now, with the benefit of having gone through the simulation, it is easy to see that the sum of 90% likely completion times for individual tasks does not equal the 90% likely completion time for the sum of the relevant individual tasks – the first three tasks in this particular case. Why? Essentially because a Monte Carlo run in which the first three tasks tasks take as long as their (individual) 90% likely completion times is highly unlikely. Exercise: use the worksheet to estimate how likely this is. There’s much more that can be learnt from the CDF. For example, it also tells us that the greatest uncertainty in the estimate is in the 5 day period from ~14 to 19 days because that’s the region in which the probability changes most rapidly as a function of elapsed time. Of course, the exact numbers are dependent on the assumed form of the distribution. I’ll say more about this in the final section. To close this section, I’d like to reprise a point I mentioned earlier: that uncertainty is a shape, not a number. 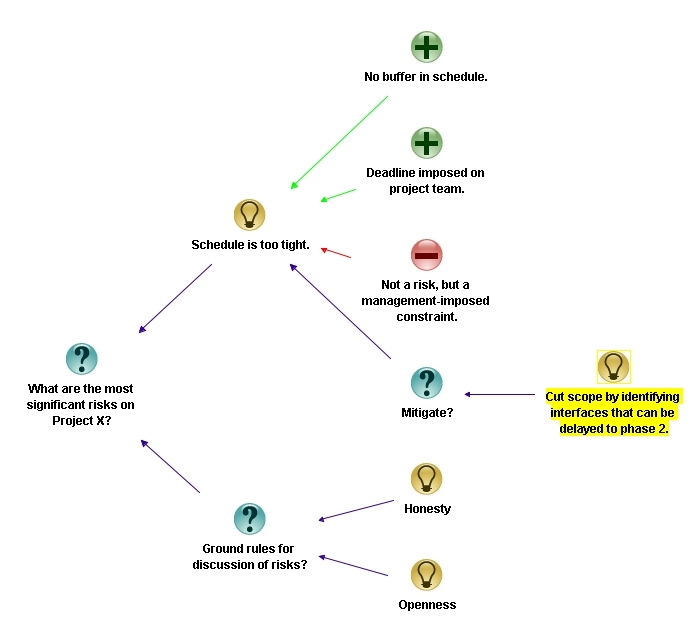 Monte Carlo simulations make the uncertainty in estimates explicit and can help you frame your estimates in the language of probability…and using a tool like Excel can help you explain these to non-technical people like your manager. We’ve covered a fair bit of ground: starting from general observations about how long a task takes, saw how to construct simple probability distributions and then combine these using Monte Carlo simulation. Before I close, there are a few general points I should mention for completeness…and as warning. First up, it should be clear that the estimates one obtains from a simulation depend critically on the form and parameters of the distribution used. The parameters are essentially an empirical matter; they should be determined using historical data. The form of the function, is another matter altogether: as pointed out in an earlier section, one cannot determine the shape of a function from a finite number of data points. Instead, one has to focus on the properties that are important. For example, is there a small but finite chance that a task can take an unreasonably long time? If so, you may want to use a lognormal distribution…but remember, you will need to find a sensible way to estimate the distribution parameters from your historical data. Second, you may have noted from the probability distribution curve (Figure 11) that despite the skewed distributions of the individual tasks, the distribution of the overall completion time is somewhat symmetric with a minimum of ~9 days, most likely time of ~16 days and maximum of 24 days. It turns out that this is a general property of distributions that are generated by adding a large number of independent probabilistic variables. 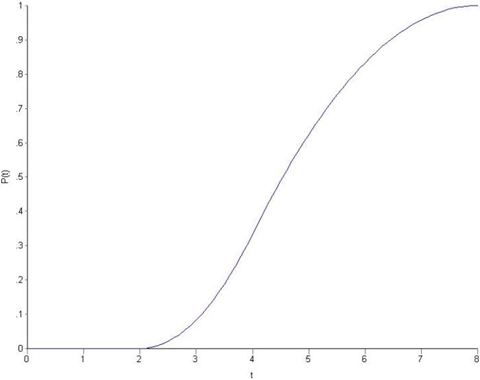 As the number of variables increases, the overall distribution will tend to the ubiquitous Normal distribution. The assumption of independence merits a closer look. In the case it hand, it implies that the completion times for each task are independent of each other. As most project managers will know from experience, this is rarely the case: in real life, a task that is delayed will usually have knock-on effects on subsequent tasks. One can easily incorporate such dependencies in a Monte Carlo simulation. A formal way to do this is to introduce a non-zero correlation coefficient between tasks as I have done here. A simpler and more realistic approach is to introduce conditional inter-task dependencies As an example, one could have an inter-task delay that kicks in only if the predecessor task takes more than 80% of its maximum time. Thirdly, you may have wondered why I used 10,000 trials: why not 100, or 1000 or 20,000. This has to do with the tricky issue of convergence. In a nutshell, the estimates we obtain should not depend on the number of trials used. Why? Because if they did, they’d be meaningless. Operationally, convergence means that any predicted quantity based on aggregates should not vary with number of trials. So, if our Monte Carlo simulation has converged, our prediction of 19.5 days for the 90% likely completion time should not change substantially if I increase the number of trials from ten to twenty thousand. I did this and obtained almost the same value of 19.5 days. The average and median completion times (shown in cell Q3 and Q4 of Sheet 1) also remained much the same (16.8 days). If you wish to repeat the calculation, be sure to change the formulas on all three sheets appropriately. I was lazy and hardcoded the number of trials. Sorry! Finally, I should mention that simulations can be usefully performed at a higher level than individual tasks. In their highly-readable book, Waltzing With Bears: Managing Risk on Software Projects, Tom De Marco and Timothy Lister show how Monte Carlo methods can be used for variables such as velocity, time, cost etc. at the project level as opposed to the task level. I believe it is better to perform simulations at the lowest possible level, the main reason being that it is easier, and less error-prone, to estimate individual tasks than entire projects. Nevertheless, high level simulations can be very useful if one has reliable data to base these on. There are a few more things I could say about the usefulness of the generated distribution functions and Monte Carlo in general, but they are best relegated to a future article. This one is much too long already and I think I’ve tested your patience enough. Thanks so much for reading, I really do appreciate it and hope that you found it useful. Acknowledgement: My thanks to Peter Holberton for pointing out a few typographical and coding errors in an earlier version of this article. These have now been fixed. I’d be grateful if readers could bring any errors they find to my attention. Throw three marbles onto a flat surface. 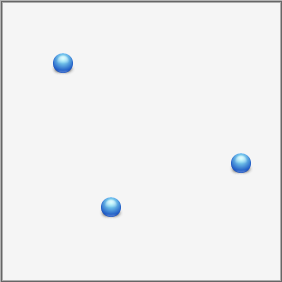 When the marbles come to rest, you are most likely to end up with a random configuration as in Figure 1. Indeed, you’d be extremely surprised if the three ended up being collinear as in Figure 2. 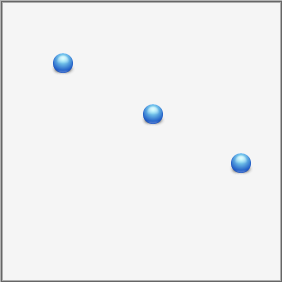 Note that Figure 2 is just one example of many collinear possibilities, but the point I’m making is that if the marbles are thrown randomly, they are more likely to end up in a random state than a lined-up one. Question: On what basis can one claim that the collinear configuration is tidier or more ordered than the non-collinear one? Naive answer: It looks more ordered. Yes, tidiness is in the eye of the beholder so it is necessarily subjective. However, I’ll wager that if one took a poll, an overwhelming number of people would say that the configuration in Figure 2 is more ordered than the one in Figure 1. More sophisticated answer : The “state” of collinear marbles can be described using 2 parameters, the slope and intercept of the straight line that three marbles lie on (in any coordinate system) whereas the description of the nonlinear state requires 3 parameters. The first state is tidier because it requires fewer parameters. 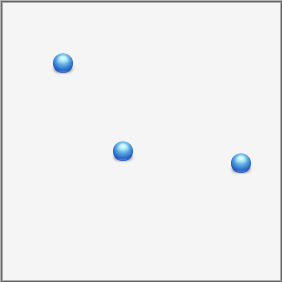 Another way to think about is that the line can be described by two marbles; the third one is redundant as far as the description of the state is concerned. Question: Why is a tidier configuration less likely than a messy one? Answer: May be you see this intuitively and need no proof, but here’s one just in case. Imagine rolling the three marbles one after the other. The first two, regardless of where they end up, will necessarily lie along a line (two points lie on the straight line joining them). Now, I think it is easy to see that if we throw the third marble randomly, it is highly unlikely end up on that line. Indeed, for the third marble to end up exactly on the same straight line requires a coincidence of near cosmic proportions. I know, I know, this is not a proof, but I trust it makes the point. Throw the marbles consecutively rather than in one go. 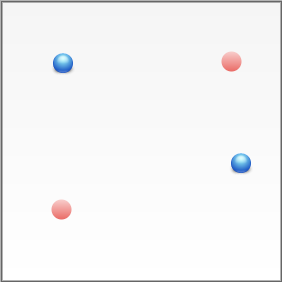 When throwing the third marble, adjust its initial speed and direction in a way that takes into account the positions of the two marbles that are already on the surface. Remember these two already define a straight line. The third throw is no longer random because it is designed to maximise the chance that the last marble will get as close as possible to the straight line defined by the first two. Done right, you’ll end up with something closer to the configuration in Figure 3 rather than the one in Figure 2. Now you’re probably wondering what this has to do with success. I’ll make the connection via an example that will be familiar to many readers of this blog: an organisation’s strategy. However, as I will reiterate later, the arguments I present are very general and can be applied to just about any initiative or situation. Typically, a strategy sets out goals for an organisation and a plan to achieve them in a specified timeframe. The goals define a number of desirable outcomes, or states which, by design, are constrained to belong to a (very) small subset of all possible states the organisation can end up in. In direct analogy with the simple model discussed above it is clear that, left to its own devices, the organisation is more likely to end up in one of the much overwhelmingly larger number of “failed states” than one of the successful ones. Notwithstanding the popular quote about there being many roads to success, in reality there are a great many more roads to failure. Of course, that’s precisely why organisations are never “left to their own devices.” Indeed, a strategic plan specifies actions that are intended to make a successful state more likely than an unsuccessful one. However, no plan can guarantee success; it can, at best, make it more likely. As in the marble game, success is ultimately a matter of chance, even when we take actions to make it more likely. Define success in terms of an end state that is a natural extension of your current state. Devise a plan to (approximately) achieve that end state. Such a plan will necessarily build on the current state rather than change it wholesale. Successful change is an evolutionary process rather than a revolutionary one. My contention is that these points are often ignored by management strategists. More often than not, they will define an end state based on a textbook idealisation, consulting model or (horror!) best practice. The marble analogy shows why copying others is unlikely to succeed. Figure 4 shows a variant of the marble game in which we have two sets of marbles (or organisations! ), one blue, as before, and the other red. 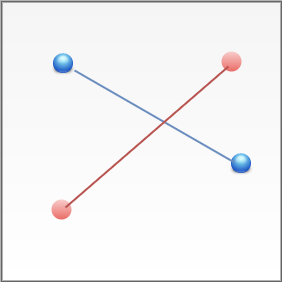 To align with both sets, the new marble has to end up close to the point that lies at the intersection of the blue and red lines in Figure 5. In contrast, to align with the blue set alone, all that’s needed is for it to get close to any point on the blue line. Finally, on a broader note, it should be clear that the arguments made above go beyond organisational strategies. They apply to pretty much any planned action, whether at work or in one’s personal life. So, to sum up: when developing an organisational (or personal) strategy, the first step is to understand where you are and then identify the minimal actions you need to take in order to get to an “improved” state that is consistent with your current one. Yes, this is akin to the incremental and evolutionary approach that Agilistas and Leaners have been banging on about for years. However, their prescriptions focus on specific areas: software development and process improvement. My point is that the basic principles are way broader because they are a direct consequence of a fundamental fact regarding the relative likelihood of order and disorder in a toddler’s room, an organisation, or even the universe at large. Develop criteria for rating options. Rate options according to criteria developed. Although this appears to be a logical way to proceed it is often difficult to put into practice, primarily because of uncertainty about matters relating to the decision. Uncertainty can manifest itself in a variety of ways: one could be uncertain about facts, the available options, decision criteria or even one’s own preferences for options. In this post, I discuss the role of uncertainty in decision making and, more importantly, how one can make well-informed decisions in such situations. Uncertainty about one’s preferences for options. Uncertainty about what criteria are relevant to evaluating the options. Uncertainty about what data is needed (data relevance). Uncertainty about the data itself (data accuracy). Each of these is qualitatively different: uncertainty about data accuracy (item 5 above) is very different from uncertainty regarding decision options (item 1). The former can potentially be dealt with using statistics whereas the latter entails learning more about the decision problem and its context, ideally from different perspectives. Put another way, the item 5 is essentially a technical matter whereas item 1 is a deeper issue that may have social, political and – as we shall see – even behavioural dimensions. It is therefore reasonable to expect that the two situations call for vastly different approaches. 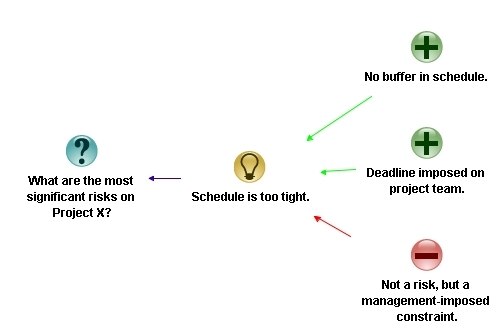 A common problem in project management is the estimation of task durations. In this case, what’s requested is a “best guess” time (in hours or days) it will take to complete a task. 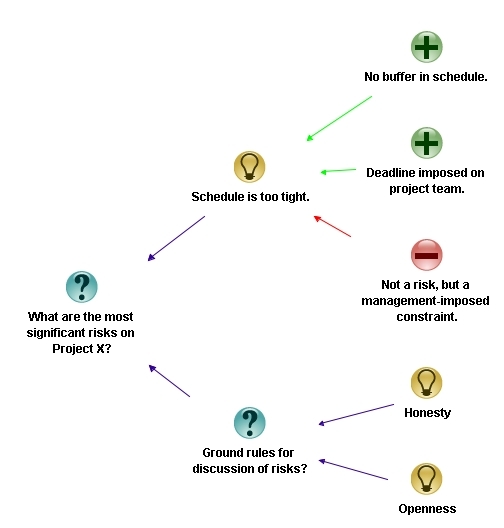 Many project schedules represent task durations by point estimates, i.e. by single numbers. 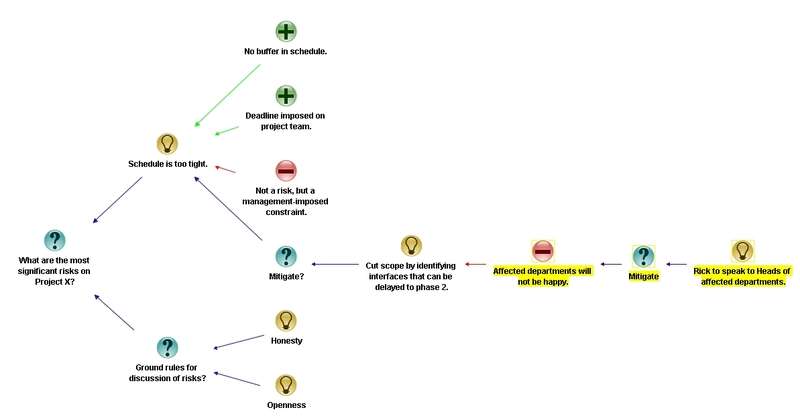 The Gantt Chart shown in Figure 1 is a common example. In it, each task duration is represented by its expected duration. This is misleading because the single number conveys a sense of certainty that is unwarranted. It is far more accurate, not to mention safer, to quote a range of possible durations. In general, quantifiable uncertainties, such as those conveyed in estimates, should always be quoted as ranges – something along the following lines: task A may take anywhere between 2 and 8 days, with a most likely completion time of 4 days (Figure 2). In this example, aside from stating that the task will finish sometime between 2 and 4 days, the estimator implicitly asserts that the likelihood of finishing before 2 days or after 8 days is zero. 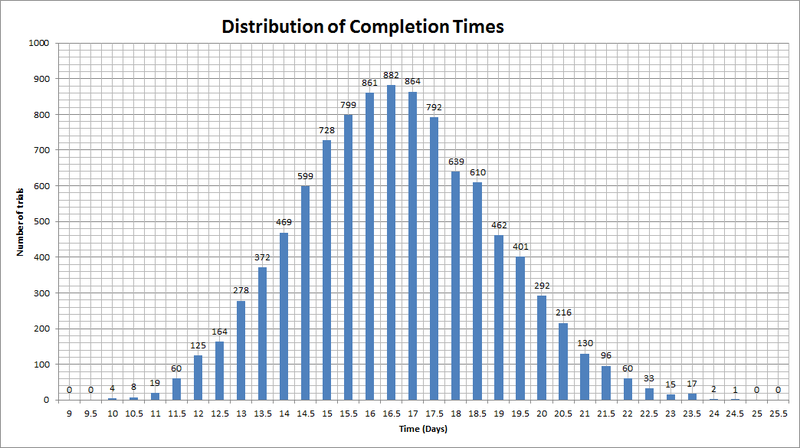 Moreover, she also implies that some completion times are more likely than others. Although it may be difficult to quantify the likelihood exactly, one can begin by making simple (linear!) approximations as shown in Figure 3. The key takeaway from the above is that quantifiable uncertainties are shapes rather than single numbers. See this post and this one for details for how far this kind of reasoning can take you. That said, one should always be aware of the assumptions underlying the approximations. Failure to do so can be hazardous to the credibility of estimators! Although I haven’t explicitly said so, estimation as described above has a subjective element. Among other things, the quality of an estimate depends on the judgement and experience of the estimator. As such, it is prone to being affected by errors of judgement and cognitive biases. However, provided one keeps those caveats in mind, the probability-based approach described above is suited to situations in which uncertainties are quantifiable, at least in principle. That said, let’s move on to more complex situations in which uncertainties defy quantification. Terminology has moved on since Knight’s time, the term uncertainty means lots of different things, depending on context. In this piece, we’ll use the term uncertainty to refer to quantifiable uncertainty (as in the task estimate of the previous section) and use ambiguity to refer to non–quantifiable uncertainty. In essence, then, we’ll use the term uncertainty for situations where we know what we’re measuring (i.e. the facts) but are uncertain about its numerical or categorical values whereas we’ll use the word ambiguity to refer to situations in which we are uncertain about what the facts are or which facts are relevant. Answer: 1 through 4 are ambiguous and 5 is uncertain. The distinction between uncertainty and ambiguity points to a problem with quantitative decision-making techniques such as cost-benefit analysis, multicriteria decision making methods or analytic hierarchy process. All these methods assume that decision makers are aware of all the available options, their preferences for them, the relevant evaluation criteria and the data needed. This is almost never the case for consequential decisions. 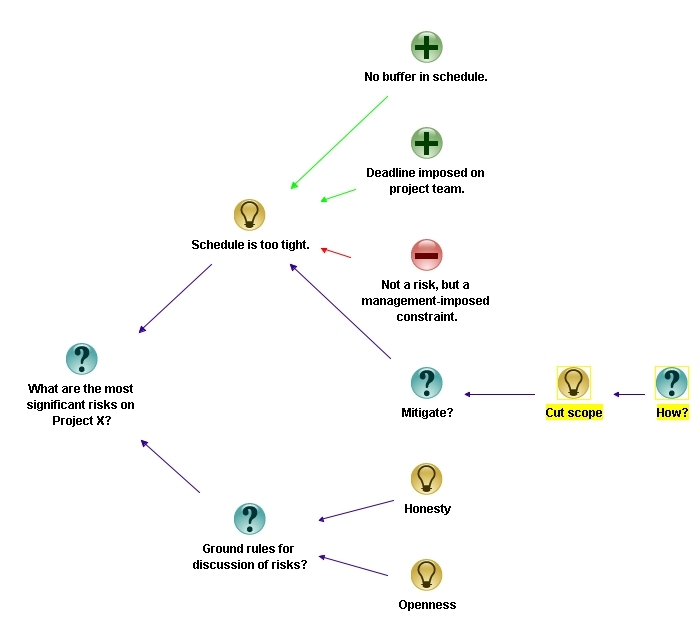 To see why, let’s take a closer look at the different ways in which ambiguity can play out in the rational decision making process mentioned at the start of this article. The first step in the process is to identify available options. In the real world, however, options often cannot be enumerated or articulated fully. Furthermore, as options are articulated and explored, new options and sub-options tend to emerge. This is particularly true if the options depend on how future events unfold. The second step is to develop criteria for rating options. As anyone who has been involved in deciding on a contentious issue will confirm, it is extremely difficult to agree on a set of decision criteria for issues that affect different stakeholders in different ways. Building a new road might improve commute times for one set of stakeholders but result in increased traffic in a residential area for others. The two criteria will be seen very differently by the two groups. In this case, it is very difficult for the two groups to agree on the relative importance of the criteria or even their legitimacy. Indeed, what constitutes a legitimate criterion is a matter of opinion. The third step is to rate options. The problem here is that real-world options often cannot be quantified or rated in a meaningful way. Many of life’s dilemmas fall into this category. For example, a decision to accept or decline a job offer is rarely made on the basis of material gain alone. Moreover, even where ratings are possible, they can be highly subjective. For example, when considering a job offer, one candidate may give more importance to financial matters whereas another might consider lifestyle-related matters (flexi-hours, commuting distance etc.) to be paramount. Another complication here is that there may not be enough information to settle the matter conclusively. As an example, investment decisions are often made on the basis of quantitative information that is based on questionable assumptions. A key consequence of the above is that such ambiguous decision problems are socially complex – i.e. different stakeholders could have wildly different perspectives on the problem itself. One could say the ambiguity experienced by an individual is compounded by the group. Horst Rittel called them wicked problems..
Russell Ackoff referred to them as messes. Herbert Simon labelled them non-programmable problems. All these terms are more or less synonymous: the root cause of the difficulty in every case is ambiguity (or unquantifiable uncertainty), which prevents a clear formulation of the problem. Social complexity is hard enough to tackle as it is, but there’s another issue that makes things even harder: ambiguity invariably triggers negative emotions such as fear and anxiety in individuals who make up the group. Studies in neuroscience have shown that in contrast to uncertainty, which evokes logical responses in people, ambiguity tends to stir up negative emotions while simultaneously suppressing the ability to think logically. One can see this playing out in a group that is debating a contentious decision: stakeholders tend to get worked up over issues that touch on their values and identities, and this seems to limit their ability to look at the situation objectively. Summarising the discussion thus far: rational decision making approaches are based on the assumption that stakeholders have a shared understanding of the decision problem as well as the facts and assumptions around it. These conditions are clearly violated in the case of ambiguous decision problems. Therefore, when confronted with a decision problem that has even a hint of ambiguity, the first order of the day is to help the group reach a shared understanding of the problem. This is essentially an exercise in sensemaking, the art of collaborative problem formulation. However, this is far from straightforward because ambiguity tends to evoke negative emotions and attendant defensive behaviours. There are a number of techniques that one can use to gather and synthesise diverse stakeholder viewpoints and thus reach a shared understanding of a complex or ambiguous problem. These techniques are often referred to as problem structuring methods (PSMs). I won’t go into these in detail here; for an example check out Paul Culmsee’s articles on dialogue mapping and Barry Johnson’s introduction to polarity management. There are many more techniques in the PSM stable. All of them are intended to help a group reconcile different viewpoints and thus reach a common basis from which one can proceed to the next step (i.e., make a decision on what should be done). In other words, these techniques help reduce ambiguity. But there’s more to it than a bunch of techniques. The main challenge is to create a holding environment that enables such techniques to work. I am sure readers have been involved in a meeting or situation where the outcome seems predetermined by management or has been undermined by self- interest. When stakeholders sense this, no amount of problem structuring is going to help. In such situations one needs to first create the conditions for open dialogue to occur. This is precisely what a holding environment provides. Creating such a holding environment is difficult in today’s corporate world, but not impossible. Note that this is not an idealist’s call for an organisational utopia. Rather, it involves the application of a practical set of tools that address the diverse, emotion-laden reactions that people often have when confronted with ambiguity. It would take me too far afield to discuss PSMs and holding environments any further here. To find out more, check out my papers on holding environments and dialogue mapping in enterprise IT projects, and (for a lot more) the Heretic’s Guide series of books that I co-wrote with Paul Culmsee. The point is simply this: in an ambiguous situation, a good decision – whatever it might be – is most likely to be reached by a consultative process that synthesises diverse viewpoints rather than by an individual or a clique. However, genuine participation (the hallmark of a holding environment) in such a process will occur only after participants’ fears have been addressed. 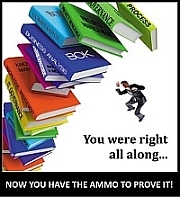 Standard approaches to decision making exhort managers and executives to begin with facts, and if none are available, to gather them diligently prior to making a decision. However, most real-life decisions are fraught with uncertainty so it may be best to begin with what one doesn’t know, and figure out how to make the possible decision under those “constraints of ignorance.” In this post I’ve attempted to outline what such an approach would entail. The key point is to figure out the kind uncertainty one is dealing with and choosing an approach that works for it. I’d argue that most decision making debacles stem from a failure to appreciate this point. Of course, there’s a lot more to this approach than I can cover in the span of a post, but that’s a story for another time. Note: This post is written as an introduction to the Data and Decision Making subject that is part of the core curriculum of the Master of Data Science and Innovation program at UTS. I’m co-teaching the subject in Autumn 2018 with Rory Angus and Alex Scriven. Data scientists are sometimes blind to the possibility that the predictions of their algorithms can have unforeseen negative effects on people. Ethical or social implications are easy to overlook when one finds interesting new patterns in data, especially if they promise significant financial gains. The Centrelink debt recovery debacle, recently reported in the Australian media, is a case in point. Centrelink is an Australian Government organisation responsible for administering welfare services and payments to those in need. A major challenge such organisations face is ensuring that their clients are paid no less and no more than what is due to them. This is difficult because it involves crosschecking client income details across multiple systems owned by different government departments, a process that necessarily involves many assumptions. In July 2016, Centrelink unveiled an automated compliance system that compares income self-reported by clients to information held by the taxation office. The problem is that the algorithm is flawed: it makes strong (and incorrect!) assumptions regarding the distribution of income across a financial year and, as a consequence, unfairly penalizes a number of legitimate benefit recipients. It is very likely that the designers and implementers of the algorithm did not fully understand the implications of their assumptions. Worse, from the errors made by the system, it appears they may not have adequately tested it either. But this did not stop them (or, quite possibly, their managers) from unleashing their algorithm on an unsuspecting public, causing widespread stress and distress. More on this a bit later. Algorithms like the one described above are the subject of Cathy O’Neil’s aptly titled book, Weapons of Math Destruction. In the remainder of this article I discuss the main themes of the book. Just to be clear, this post is more riff than review. However, for those seeking an opinion, here’s my one-line version: I think the book should be read not only by data science practitioners, but also by those who use or are affected by their algorithms (which means pretty much everyone!). ‘O Neil begins with the observation that data algorithms are mathematical models of reality, and are necessarily incomplete because several simplifying assumptions are invariably baked into them. This point is important and often overlooked so it is worth illustrating via an example. When assessing a person’s suitability for a loan, a bank will want to know whether the person is a good risk. It is impossible to model creditworthiness completely because we do not know all the relevant variables and those that are known may be hard to measure. To make up for their ignorance, data scientists typically use proxy variables, i.e. variables that are believed to be correlated with the variable of interest and are also easily measurable. In the case of creditworthiness, proxy variables might be things like gender, age, employment status, residential postcode etc. Unfortunately many of these can be misleading, discriminatory or worse, both. The Centrelink algorithm provides a good example of such a “double-whammy” proxy. The key variable it uses is the difference between the client’s annual income reported by the taxation office and self-reported annual income stated by the client. A large difference is taken to be an indicative of an incorrect payment and hence an outstanding debt. This simplistic assumption overlooks the fact that most affected people are not in steady jobs and therefore do not earn regular incomes over the course of a financial year (see this article by Michael Griffin, for a detailed example). Worse, this crude proxy places an unfair burden on vulnerable individuals for whom casual and part time work is a fact of life. Worse still, for those wrongly targeted with a recovery notice, getting the errors sorted out is not a straightforward process. This is typical of a WMD. As ‘O Neil states in her book, “The human victims of WMDs…are held to a far higher standard of evidence than the algorithms themselves.” Perhaps this is because the algorithms are often opaque. But that’s a poor excuse. This is the only technical field where practitioners are held to a lower standard of accountability than those affected by their products. ‘O Neil’s sums it up rather nicely when she calls algorithms like the Centrelink one weapons of math destruction (WMD). A characteristic of WMD is that their predictions often become self-fulfilling prophecies. For example a person denied a loan by a faulty risk model is more likely to be denied again when he or she applies elsewhere, simply because it is on their record that they have been refused credit before. This kind of destructive feedback loop is typical of a WMD. An example that ‘O Neil dwells on at length is a popular predictive policing program. Designed for efficiency rather than nuanced judgment, such algorithms measure what can easily be measured and act by it, ignoring the subtle contextual factors that inform the actions of experienced officers on the beat. Worse, they can lead to actions that can exacerbate the problem. For example, targeting young people of a certain demographic for stop and frisk actions can alienate them to a point where they might well turn to crime out of anger and exasperation. 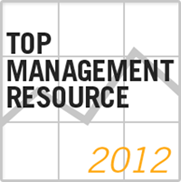 This is not news: savvy managers have known about the dangers of managing by metrics for years. The problem is now exacerbated manyfold by our ability to implement and act on such metrics on an industrial scale, a trend that leads to a dangerous devaluation of human judgement in areas where it is most needed. A related problem – briefly mentioned earlier – is that some of the important variables are known but hard to quantify in algorithmic terms. For example, it is known that community-oriented policing, where officers on the beat develop relationships with people in the community, leads to greater trust. The degree of trust is hard to quantify, but it is known that communities that have strong relationships with their police departments tend to have lower crime rates than similar communities that do not. Such important but hard-to-quantify factors are typically missed by predictive policing programs. Ironically, although WMDs can cause destructive feedback loops, they are often not subjected to feedback themselves. O’Neil gives the example of algorithms that gauge the suitability of potential hires. These programs often use proxy variables such as IQ test results, personality tests etc. to predict employability. Candidates who are rejected often do not realise that they have been screened out by an algorithm. Further, it often happens that candidates who are thus rejected go on to successful careers elsewhere. However, this post-rejection information is never fed back to the algorithm because it impossible to do so. In such cases, the only way to avoid being blackballed is to understand the rules set by the algorithm and play according to them. As ‘O Neil so poignantly puts it, “our lives increasingly depend on our ability to make our case to machines.” However, this can be difficult because it assumes that a) people know they are being assessed by an algorithm and 2) they have knowledge of how the algorithm works. In most hiring scenarios neither of these hold. Just to be clear, not all data science models ignore feedback. For example, sabermetric algorithms used to assess player performance in Major League Baseball are continually revised based on latest player stats, thereby taking into account changes in performance. Scheduling software can be seen as an extension of just-in-time economy. But instead of lawn mower blades or cell phone screens showing up right on cue, it’s people, usually people who badly need money. And because they need money so desperately, the companies can bend their lives to the dictates of a mathematical model. Following [a] New York Times report on Starbucks’ scheduling practices, Democrats in Congress promptly drew up bills to rein in scheduling software. But facing a Republican majority fiercely opposed to government regulations, the chances that their bill would become law were nil. The legislation died. Commercial interests invariably trump social and ethical issues, so it is highly unlikely that industry or government will take steps to curb the worst excesses of such algorithms without significant pressure from the general public. A first step towards this is to educate ourselves on how these algorithms work and the downstream social effects of their predictions. The idea was to encourage people to spread the word that they had voted. This seemed reasonable enough. By sprinkling people’s news feeds with “I voted” updates, Facebook was encouraging Americans – more that sixty-one million of them – to carry out their civic duty….by posting about people’s voting behaviour, the site was stoking peer pressure to vote. Studies have shown that the quiet satisfaction of carrying out a civic duty is less likely to move people than the possible judgement of friends and neighbours…The Facebook started out with a constructive and seemingly innocent goal to encourage people to vote. And it succeeded…researchers estimated that their campaign had increased turnout by 340,000 people. That’s a big enough crowd to swing entire states, and even national elections. For three months leading up to the election between President Obama and Mitt Romney, a researcher at the company….altered the news feed algorithm for about two million people, all of them politically engaged. The people got a higher proportion of hard news, as opposed to the usual cat videos, graduation announcements, or photos from Disney world…. [the researcher] wanted to see if getting more [political] news from friends changed people’s political behaviour. Following the election [he] sent out surveys. The self-reported results that voter participation in this group inched up from 64 to 67 percent. This might not sound like much, but considering the thin margins of recent presidential elections, it could be enough to change a result. In an experiment with people who use Facebook, we test whether emotional contagion occurs outside of in-person interaction between individuals by reducing the amount of emotional content in the News Feed. When positive expressions were reduced, people produced fewer positive posts and more negative posts; when negative expressions were reduced, the opposite pattern occurred. These results indicate that emotions expressed by others on Facebook influence our own emotions, constituting experimental evidence for massive-scale contagion via social networks. As you might imagine, there was a media uproar following which the lead researcher issued a clarification and Facebook officials duly expressed regret (but, as far as I know, not an apology). To be sure, advertisers have been exploiting this kind of “mind control” for years, but a public social media platform should (expect to) be held to a higher standard of ethics. Facebook has since reviewed its internal research practices, but the recent fake news affair shows that the story is to be continued. The Centrelink debt debacle, Facebook mood contagion experiments and the other case studies mentioned in the book illusrate the myriad ways in which Big Data algorithms have a pernicious effect on our day-to-day lives. Quite often people remain unaware of their influence, wondering why a loan was denied or a job application didn’t go their way. Just as often, they are aware of what is happening, but are powerless to change it – shift scheduling algorithms being a case in point. This is not how it was meant to be. Technology was supposed to make life better for all, not just the few who wield it. Develop a code of ethics for data science practitioners. It is heartening to see that IEEE has recently come up with a discussion paper on ethical considerations for artificial intelligence and autonomous systems and ACM has proposed a set of principles for algorithmic transparency and accountability. However, I should also tag this suggestion with the warning that codes of ethics are not very effective as they can be easily violated. One has to – somehow – embed ethics in the DNA of data scientists. I believe, one way to do this is through practice-oriented education in which data scientists-in-training grapple with ethical issues through data challenges and hackathons. It is as Wittgenstein famously said, “it is clear that ethics cannot be articulated.” Ethics must be practiced. Put in place a system of reliable algorithmic audits within data science departments, particularly those that do work with significant social impact. Increase transparency a) by publishing information on how algorithms predict what they predict and b) by making it possible for those affected by the algorithm to access the data used to classify them as well as their classification, how it will be used and by whom. Encourage the development of algorithms that detect bias in other algorithms and correct it. Inspire aspiring data scientists to build models for the good. Big Data processes codify the past. They do not invent the future. Doing that requires moral imagination, and that’s something that only humans can provide. We have to explicitly embed better values into our algorithms, creating Big Data models that follow our ethical lead. Sometimes that will mean putting fairness ahead of profit. Excellent words for data scientists to live by. An irony of organisational life is that the most important decisions on projects (or any other initiatives) have to be made at the start, when ambiguity is at its highest and information availability lowest. I recently gave a talk at the Pune office of BMC Software on improving decision-making in such situations. Based on the questions asked and the feedback received, I reckon that a number of people found the talk useful. I’d welcome your comments/feedback. Acknowledgements: My thanks go out to Gaurav Pal, Manish Gadgil and Mrinalini Wankhede for giving me the opportunity to speak at BMC, and to Shubhangi Apte for putting me in touch with them. Finally, I’d like to thank the wonderful audience at BMC for their insightful questions and comments. Last week, my friend Paul Culmsee conducted an internal workshop in my organisation on the theme of collaborative problem solving. Dialogue mapping is one of the tools he introduced during the workshop. This piece, primarily intended as a follow-up for attendees, is an introduction to dialogue mapping via a vignette that illustrates its practice (see this post for another one). I’m publishing it here as I thought it might be useful for those who wish to understand what the technique is about. Dialogue mapping uses a notation called Issue Based Information System (IBIS), which I have discussed at length in this post. For completeness, I’ll begin with a short introduction to the notation and then move on to the vignette. Issues(or questions): these are issues that are being debated. Typically, issues are framed as questions on the lines of “What should we do about X?” where X is the issue that is of interest to a group. For example, in the case of a group of executives, X might be rapidly changing market condition whereas in the case of a group of IT people, X could be an ageing system that is hard to replace. Ideas(or positions): these are responses to questions. For example, one of the ideas of offered by the IT group above might be to replace the said system with a newer one. Typically the whole set of ideas that respond to an issue in a discussion represents the spectrum of participant perspectives on the issue. Arguments: these can be Pros (arguments for) or Cons (arguments against) an issue. The complete set of arguments that respond to an idea represents the multiplicity of viewpoints on it. Compendium is a freeware tool that can be used to create IBIS maps– it can be downloaded here. In Compendium, IBIS elements are represented as nodes as shown in Figure 1: issues are represented by blue-green question marks; positions by yellow light bulbs; pros by green + signs and cons by red – signs. Compendium supports a few other node types, but these are not part of the core IBIS notation. Nodes can be linked only in ways specified by the IBIS grammar as I discuss next. Issues can be raised anew or can arise from other issues, positions or arguments. In other words, any IBIS element can be questioned. In Compendium notation: a question node can connect to any other IBIS node. 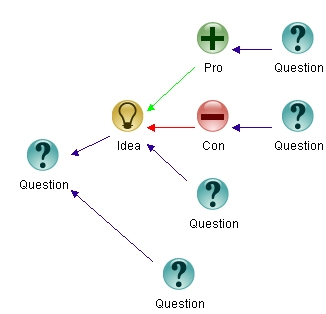 Ideas can only respond to questions– i.e. in Compendium “light bulb” nodes can only link to question nodes. The arrow pointing from the idea to the question depicts the “responds to” relationship. The legal links are summarized in Figure 2 below. …and that’s pretty much all there is to it. The interesting (and powerful) aspect of IBIS is that the essence of any debate or discussion can be captured using these three elements. Let me try to convince you of this claim via a vignette from a discussion on risk. He then asked if there were any questions. The head waggles around the room indicated there were none. Twenty minutes later, most people were done and back in their seats. “OK, it looks as though most people are done…Ah, Joe, Mike have you guys finished?” The two were still working on their flip-chart at the back. “Yeah, be there in a sec,” replied Mike, as he tore off the flip-chart page. …Rick finished the point as Rob was speaking. “I hear you Rob, but I think it is important we capture everything that is said,” said Helen. “OK, so any other points that anyone would like to add to the ones made so far?” Queried Rick as he finished typing. He looked up. Most of the people seated round the table shook their heads indicating that there weren’t. “We haven’t spoken about mitigation strategies. Any ideas?” Asked Rick, as he created a question node marked “Mitigation?” connecting to the risk. “OK,” said Rick, entering the point as an idea connecting to the “Mitigation?” question. “Did you think about how you are going to do this? He entered the question “How?” connecting to Mike’s point. “We’re all ears,” said Rick. There was a silence in the room as everyone pondered this point. “Yep, that’s fine,” said Helen. Mike nodded OK.
Rick deleted the “How?” node connecting to the “Cut scope” idea, and edited the latter to capture Helen’s point. “That’s great in theory, but who is going to talk to the affected departments? They will not be happy.” asserted Rob. One could always count on compliance to throw in a reality check. “Good point,” said Rick as he typed that in as a con, “and I’ll take the responsibility of speaking to the department heads about this,” he continued entering the idea into the map and marking it as an action point for himself. “Is there anything else that Joe, Mike…or anyone else would like to add here,” he added, as he finished. “Yeah me too,” said Helen. The discussion continued…but the fly on the wall was no longer there to record it. I hope this little vignette illustrates how IBIS and dialogue mapping can aid collaborative decision-making / problem solving by making diverse viewpoints explicit. That said, this is a story, and the problem with stories is that things go the way the author wants them to. In real life, conversations can go off on unexpected tangents, making them really hard to map. So, although it is important to gain expertise in using the software, it is far more important to practice mapping live conversations. The latter is an art that requires considerable practice. I recommend reading Paul Culmsee’s series on the practice of dialogue mapping or <advertisement> Chapter 14 of The Heretic’s Guide to Best Practices</advertisement> for more on this point. That said, there are many other ways in which IBIS can be used, that do not require as much skill. Some of these include: mapping the central points in written arguments (what’s sometimes called issue mapping) and even decisions on personal matters. To sum up: IBIS is a powerful means to clarify options and lay them out in an easy-to-follow visual format. Often this is all that is required to catalyse a group decision.